The IEEE Canada Outstanding Engineer Medal: For contributions to the study of several classes of nano-materials. Federico Rosei (SMIEEE) is Professor and Director of the Centre Énergie, Matériaux et Télécommunications of INRS, Varennes (QC) Canada. Since January 2014 he has held the UNESCO Chair in Materials and Technologies for Energy Conversion, Saving and Storage and since May 2016 he also holds the Canada Research Chair (Tier I) in Nanostructured Materials. He received MSc (1996) and PhD (2001) degrees from the University of Rome "La Sapienza". Dr. Rosei has reported major discoveries on structure/property relationships in nanostructured (inorganic, organic and biocompatible) materials. He has synthesized a number of novel nanoscale materials to address emerging challenges in solid state science and technology, designing and fabricating novel optoelectronic and photonic devices. He synthesized novel Quantum Dots with original architectures, tailoring structure vs. properties and integrating them in various devices, such as nanothermometers, photovoltaics and photoelectrochemical solar cells, reporting record performances. He has published more than 245 articles in prestigious international journals, and spoken at more than 250 international conferences. He is Fellow of the Royal Society of Canada, the Canadian Academy of Engineering, the Engineering Institute of Canada, the European Academy of Science, the World Academy of Art and Science, the American Physical Society and the Institution of Engineering and Technology, amongst many others. 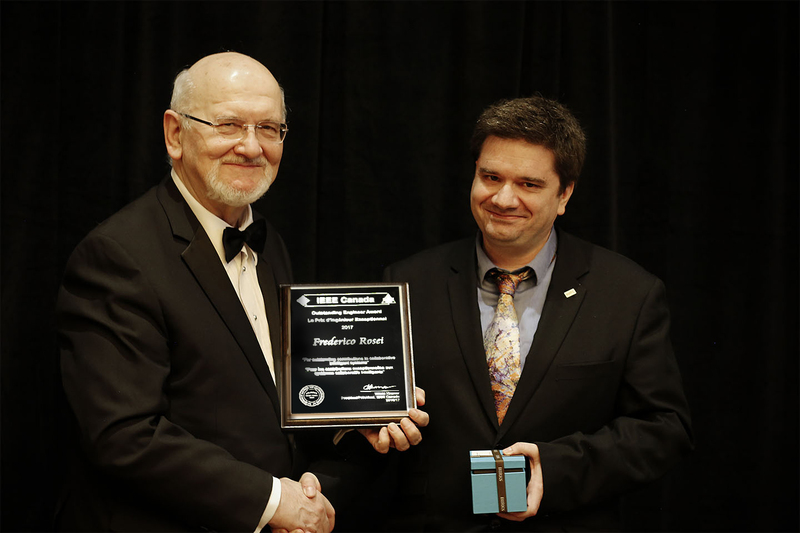 He held the IEEE Nanotechnology Council's Distinguished Lectureship for 2015. Dr. Rosei's research has been recognized internationally through awards from numerous organizations including Humboldt Foundation (Bessel Award), NSERC (Steacie Fellowship), Canadian Association of Physics, Canadian Society for Chemistry, as well as from the governments of China and Iran. The IEEE Canada R.H. Tanner Medal: For outstanding contributions to collaborative intelligent systems. Weiming Shen (FIEEE) is a Senior Research Scientist at National Research Council Canada and an Adjunct Professor at Western University. He received his Bachelor and Master's degrees from Beijing Jiaotong University, China (in 1983 and 1986) and his PhD degree from the University of Technology of Compiègne, France, in 1996. He worked as a lecturer at Beijing Jiaotong University from 1986 to 1992, and has been working at National Research Council since 1999. Dr. Shen has significantly advanced the field of collaborative intelligent systems. As a pioneer in the field, he developed a reference architecture and integration methodology that became a theoretical foundation of agent-based collaboration to solve difficult legacy systems integration problems. His iShop Floor concept was recommended by Society of Manufacturing Engineers and adopted by many companies. His recent contribution is on the development/deployment of smart building technologies in 10+ government buildings. The promising results of 15% average energy savings have triggered a plan for wide deployment in 100+ buildings with projected savings of $10M per year while reducing GHG emissions. 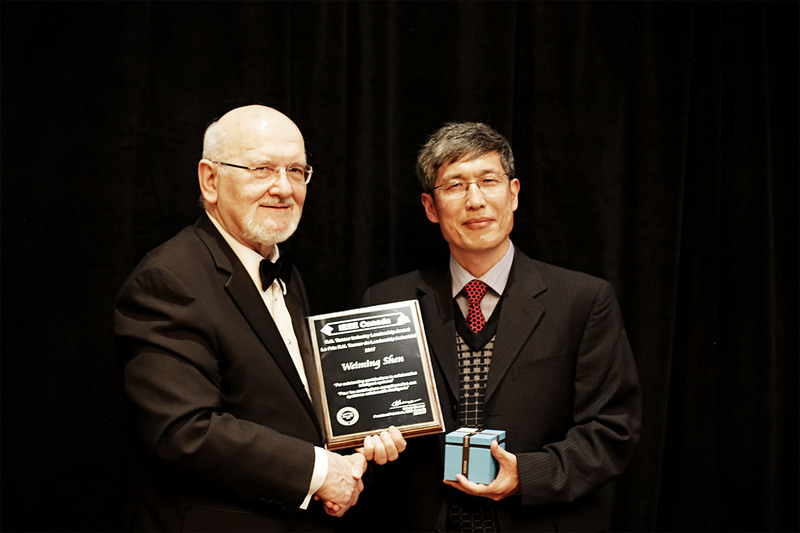 Dr. Shen is a member of the Steering Committee for IEEE Transactions on Affective Computing and Associate Editor of several journals including: IEEE Transactions on Automation Science and Engineering; IEEE Transactions on SMC: Systems; IEEE SMC Magazine; Computational Intelligence; and Intelligent Buildings International. He is Co- Chair of IEEE Technical Committee on Computer Supported Cooperative Work in Design, and served as Chair/Co-Chair for more than 30 international conferences. He is a Fellow of Engineering Institute of Canada and member of Professional Engineers Ontario. Following members were elevated since June 2017. Congratulations on the achievement!